Sip’N’Stich came last week! The yarn is a gorgeous gorgeous red that photographs do not do justice. I haven’t tried out the coffee (Cafe Femenino from Joe Van Gogh) yet because, believe it or not, I still have some left from the previous shipment. I guess I just haven’t needed/wanted the caffeine as much in the mornings lately. I’ve been choosing to have tea instead. Maybe it’s a comfort thing, picking tea over coffee. 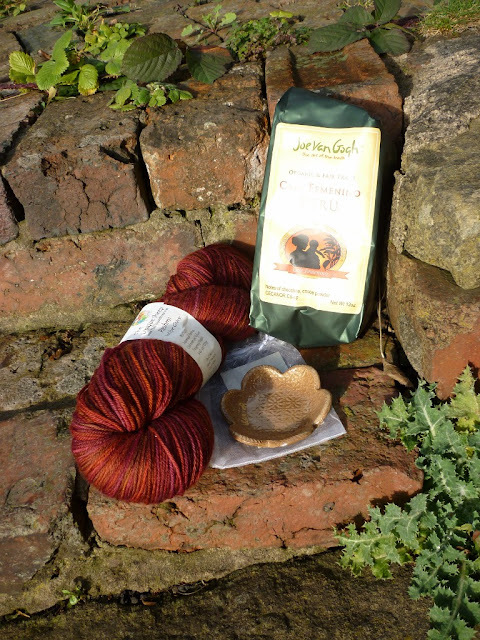 The January shipment of The Great British Wool Club also came. It’s a very pretty blue, 50/50 blend of BFL and Exmoor Blueface. Don’t know what it wants to be yet, but as the whole club is coming from a co-ordinated palate and spun to the same specs, I may save it for a colourwork project. Photos are up on my Rav stash page for those interested. That Lia sweater I’d started last time? In the frog pond. I’d finished the cable chart and decided to try it on. It just did not look flattering on me. I don’t know what exactly it was about the fit, but it just didn’t seem good. The cabling section fell wrong and I decided that it didn’t matter how much work I’d already put into the sweater, I was not going to knit a sweater that I wouldn’t love and especially one that wouldn’t fit. And cast on a shawlette. I’m using Luxe Soles from Stitches’N’Rows in a custom colourway (Purple berries’n’cream) with my 3.75mm Signature circs. The pattern is Minttumaari. It’s free, from Ullaneule.net, and only available in Finnish. It’s took me a little while to get used to all of the Finnish terminology (since almost all of my knitting knowledge is in English), but I think I’ve got the hang of it again. The shawl for my mom is going along well. Almost eight repeats of the Body Chart are done on the second half and I’m still enjoying it immensely. Lace patterning on both sides keeps me interested, but it’s not too difficult to keep track of. The shawlette has patterning only on the RS so it’s my travel/knit night knitting. And it’s kinda boring me already, even though I only cast it on last week and haven’t worked on it that much. But the result is pretty so I’m going to keep knitting it. And that’s it for now. I’ve still got two book reviews (both fiction) and a confession to make, but they will have to wait until next time.